I love to make filling and healthy home cooked meals for my family, and this recipe is spot on each and every time. It is loaded with flavors and nutrients and tastes as good on the next day. Pork loin makes a frequent appearance at our table and everyone loves it. It is versatile, delectable, and easy to fix. My family fell for this tasty meal, and I often make it for special occasions. 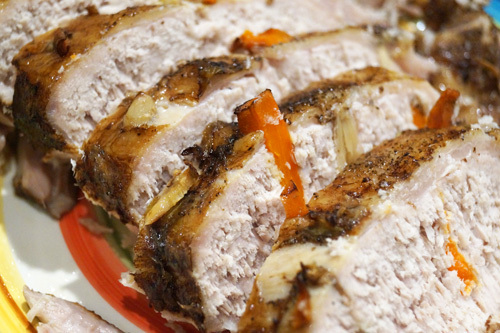 Pork loin is juicy and tender and combines perfectly with garlic and baby carrots. It is definitely a meal-in-one. Rinse pork loin first and use paper towels to dry. If there is excess fat, you can trim it off. Make deep cuts with a sharp knife. The cuts must be 1/4 inch apart and parallel. Stuff the meat with carrots and garlic. Use household string to tie the pork loin firmly and tie at intervals. Combine olive oil, water, and soy sauce, mix well, and season the entire surface. This is a great way to produce juicy pork loin and add more flavor. Seasoning enhances the flavor. Preheat oven and bake for 2 hours at 375 F or until cooked (the time required to cook depends on size). Bake pork loin covered. Leave to cool for 5 - 10 minutes once cooked and then carve. Cut into thick or thin slices and arrange the slices on a platter. Serve with green leafy salad.